Are your trees beginning to look a little bit scraggly? 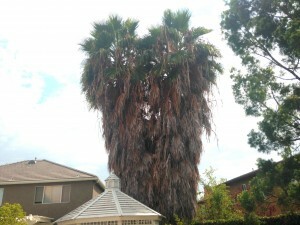 Here are a pair of palms that really need a palm tree trimming… They should probably call our Orange County tree service today! Okay… Actually, they did call our tree service. We just forgot to take “after pictures.” Basically imagine these un trimmed palm trees without all of the excess brown growth around the base. Picture the well groomed palm trees outside of In-n-Out burger for example. Our crews of skilled tree climbers went to work early in the morning and made quick work of these queen palms. Our second job this week was doing tree trimming for a home owners association. 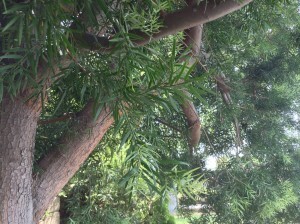 You can see an image below of the rows and rows of freshly trimmed trees in North Tustin. There are few tree companies with the kind of consistency and trustworthiness that you will get from Orange County Tree Service. From the tree climbers all the way up to our office staff, you can be sure that your precious foliage will be well taken care of. Your freshly trimmed trees will make your house look infinitely tidier than it did before!